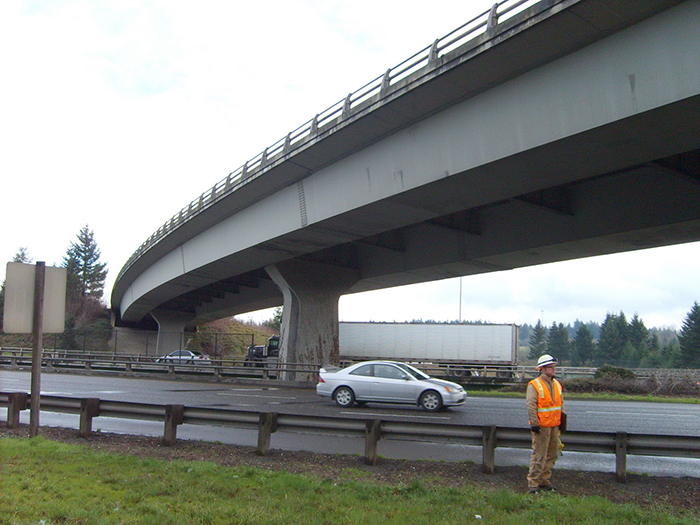 Kamal’s Bridge in Tualatin, a steel box-girder bridge with four spans, was included as part of the statewide structural health monitoring (SHM) program for the Oregon Department of Transportation (ODOT). Kamal’s Bridge facilitates the southbound Interstate 205 crossing of Interstate 5. ODOT sought to improve the monitoring of this bridge’s structural response to changes in temperature and traffic load. This was needed because fatigue cracking appeared between the longitudinal box girders on either side of the composite concrete bridge deck, and the transverse cross beams. Identifying the nature and cause of the bridge’s fatigue cracking posed a challenge due to the superstructure’s high lateral and torsional stiffness, and significant horizontal curve. The cracked and suspect connections were retrofitted, but ODOT desired a monitoring system to verify the effectiveness of the retrofits. ODOT employed Engineered Monitoring Solutions (EMS) to design and install the monitoring system for the bridge. This system collected data regarding the strain in the box-girder and cross-beam diaphragms, as well as the rotation between them. In addition, the surface temperature of the box girders and the air temperature were monitored. Campbell Scientific’s CR9000X datalogger collected sensor data from the 83 sensors employed in the system. The sensor data was collected at two frequencies. Lower-frequency data was used to record the effect of temperature changes on the bridge’s performance. The datalogger recorded higher-frequency data (100 times per second) in response to short-term, live-load effects based on predetermined event criteria, whereby a larger traffic load caused one or more of the strain gages to exceed its strain threshold. The bridge’s temperature and traffic load data was uploaded hourly from the datalogger to ODOT’s computer network to help bridge engineers assess the effectiveness of the structural retrofits on Kamal’s Bridge.